Mortars and missiles target IDF troops; six wounded, two dead. UN soldier killed in crossfire. 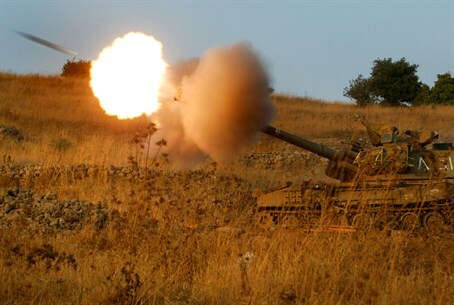 Antitank missiles were fired at two IDF vehicles from the Har Dov area (Shebaa Farms) in a Hezbollah ambush Wednesday morning. Six casualties in light to moderate condition have been taken to Ziv Hospital in Tzfat. Additional casualties were evacuated to Rambam Hospital, but so far, no information has been released about their condition. The IDF is certain that none of its soldiers was abducted. Hezbollah has released photos that it says show the IDF's vehicles after they were hit. Hezbollah has claimed responsibility for the attack, initially through journalist Rassan Ben Jiddo, who is close to the terrorist militia. The terror militia issued an announcement shortly after 1:00 p.m., in which it said that a squad named for "the Martyrs of Quneitra" fired at an IDF convoy at 11:35 and caused casualties. The announcement was presented as "Announcement Number 1," in a hint that additional operations could follow this attack. As of 1:30 p.m., exchanges of fire between the IDF and Hezbollah were ongoing. IDF Spokesman Moti Almoz said that the IDF has not yet said the last word in its response to the attack. Hezbollah has asked UNIFIL to tell Israel that it is asking for a cessation of fire, according to Channel 2. A Spanish UNIFIL soldier was killed by the IDF's fire into Lebanon, according to the UN Spokesman as quoted by Al Jazeera. He has been identified as a 36-year-old corporal, according to AFP. Spain's Defense Minister Pedro Morenes, who was flying to India for a three-day visit, cancelled the trip and returned to Spain mid-flight, the ministry said; Prime Minister Mariano Rajoy expressed on Twitter his "great sadness at the death of a Spanish soldier in Lebanon." The IDF spokesman said that an antitank missile was fired at an IDF vehicle that was moving along the border. Channel 2 said there was also mortar fire at IDF outposts. Speaking on Channel 2, Col. (res.) Kobi Marom called the incident "very serious" and said that it involved casualties and will require a harsh Israeli response. In an initial reaction, Prime Minister Binyamin Netanyahu, who was in Sderot, said: "Anyone who tries to challenge us in the north should look at what happened to Hamas, not far from here, which was recently dealt the hardest blow it has received since its creation." Residents of Metula were initially told to stay inside their homes but were later given the all clear. The IDF has been firing at several targets in Lebanon in retaliation, since the incident began. Meanwhile, The IDF has begun digging into the soil along Israels border with Lebanon, in search of attack tunnels that may have been dug by Hezbollah terrorists into Israeli territory. Kol Yisrael Radio reported Wednesday that a drill was brought to a location near Zar'it and that it has begun to bore into the ground, in search of tunnels. The military said that it does not have any information indicating that Hezbollah has, indeed, dug tunnels into Israel, and that the move is mainly being carried out to allay the fears of local residents, who have been reporting for years that they hear digging sounds from the ground at night. The drilling comes as preparation is high on the northern border, after Hezbollah fired rockets on Israel on Tuesday prompting an Israeli response. That exchange followed a reportedly Israeli strike on senior Hezbollah terrorists and an Iranian general last Sunday, who were apparently planning an attack on Israel. Residents along the border have also been pointing to suspicious sights and actions beyond the border fence which they believe indicate the digging of tunnels. Recently, they have been saying that they will hire equipment at their own expense to look for tunnels, if the IDF does not do so itself. When asked about the digging noises earlier this month, Defense Minister Moshe Ya'alon (Likud) claimed "no tunnels have been located on the northern border. Noises that were heard beneath a home turned out to be a neighbor's horse stomping with its hooves." But a video posted on YouTube recently, said to have been filmed at night in Shtula on the border with Lebanon, had many seriously doubting Ya'alon's claims. Highlighting fears for many is the fact that the government was initially unwilling to destroy Hamas's terror tunnels at the outset of the fighting in Gaza earlier this year. The IDF only took action against the tunnels after several of them were used with lethal effect by Hamas, and after IDF surveillance footage showed large terrorist squads emerging from holes in the ground in Israeli territory. After the war, the government admitted that Hamas planned to use the tunnels for a deadly attack that it planned for Rosh Hashana. Jewish Home head Naftali Bennett has claimed to have prodded the government into launching the ground offensive against the tunnels, claims which independent investigative reports supported. Prime Minister Binyamin Netanyahu said that Operation Protective Edge “damaged a strategic array that Hamas put a huge effort into, for years. The ability that Hamas prepared in digging these tunnels would have enabled it to abduct and murder numerous citizens and IDF soldiers by a simultaneous attack from many tunnels that penetrate our territory."